Although the rainy season does little to bring Portlanders indoors, the rodents of Portland move inside in greater numbers when the weather becomes consistently wet and cold. Fall and winter are marked by a noticeable increase in rodent activity in and around homes and businesses in our area. What most Portlanders are not aware of however, is that rats are actually a year round pest in the Pacific Northwest, and can enter homes and businesses during unpredictable times and seasons. Understanding rat behavior and habits, the dangers they pose to humans and property, as well as things we can do to manage rat infestations, helps us to regain control over these unwelcome invaders and reestablish our peace of mind. Are rats active in the winter? Yes, rats are active in the winter months. Many people seem to think that rats go dormant as the temperature cools, but that is not the case. Rats don’t do well in harsh conditions. In order for rats to survive, they must find a warm environment with a reliable food supply. Unfortunately, this ideal environment is often inside homes and businesses in the greater Portland area. 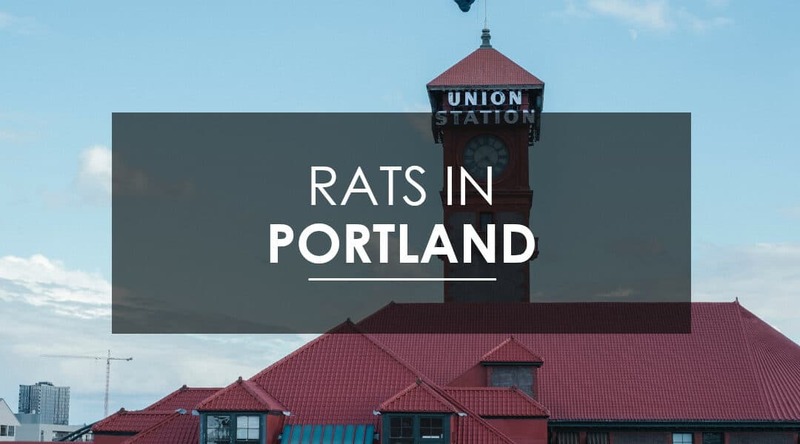 What species of rats live in Portland? There are two species of rats that are found in Portland. The Norway rat, which is most common, is usually brownish gray in color. It is larger in size than its counterpart, the roof rat. The roof rat, commonly called the “black rat”, is usually black in color with a lighter underbelly. The roof rat has a long and scaly tail. Typically, Norway rats are ground dwellers. They tend to gain access to homes through buroughing, usually through crawl spaces or places in the foundation or siding where the integrity of the structure is compromised. Damaged or breached crawl space vent covers are another major entry point for rats into homes in the Pacific Northwest. The roof rat tends to gain access to a shelter through attics. Roof rats are known to scale power lines, trees, and gutters to make their way to the upper levels of a building where they will look for openings to enter a structure. Although all rat infestations can be difficult to deal with, it’s often more difficult to get rid of roof rat. Generally speaking, home and business owners can think of norway rats as mainly being confined to living at or below ground level, whereas roof rats tend to establish nests above ground level. What circumstances lead to rat problems in Portland? There are a number of factors that can contribute to a rat infestation. These factors almost always involve easy access to food and convenient shelter. A general knowledge of what contributes to a rat problem will help you to avoid setting up an environment that is appealing to rats. Any gaps, cracks, or small holes larger than ¼ inch are large enough for a rat to squeeze through. Ensure that your vents, screens, windows, doors, foundations, and thresholds are in good repair. Ms. Sanchez also points out that “what we know from population ecology science is that without reducing the support (e.g. food and shelter) for a population, removal of individuals alone cannot achieve a significant reduction of the population over mid to longer terms of time.” Sometimes licensed exterminators can be a homeowner’s best resource for practical ideas and help with reducing environmental factors that may be supporting a rat population. Many times, as a rat problem is beginning to take hold, the residents of a home will not physically see rats, but they will find other evidence of their presence. Do I have rats in my vehicle? You may find it surprising, but animals often seek shelter inside automobiles. This occurs more often as the temperatures begin to dip and an engine provides appealing warmth. You can typically determine if your automobile has a rat problem by looking for droppings, dusty footprints, and/or teeth marks on soft surfaces. The presence of rats in your car can cause major damage, both to your vehicle and to your health. Rat teeth are constantly growing, so they continuously gnaw to file them down. Rats love the fatty insulation in electrical wiring, so it’s not uncommon for a rat to gain access to an automobile and begin to chew its way through the wiring. Problems with wiring are generally difficult to diagnose, so a rodent chewing on the wires compounds an already difficult problem and can lead to costly repairs. Depending on where a rat takes up residence under the hood, the cabin filter could pull in air contaminated by rat excrement any time that the interior vent is turned on. This puts the driver and any passengers at risk for dangerous airborne disease. Prevention is the best way to keep your vehicle rat free. If possible, always park in a garage. If you’re going to be leaving your vehicle sitting for a period of time, be sure that that it doesn’t contain food, including crumbs. Whenever possible, avoid parking near trash cans, such as in an alley or in a parking lot near a dumpster. Rats can spread a number of dangerous diseases as well as cause major property damage. So yes, rats are harmful and any sign of a rat problem requires immediate attention. Diseases can be spread by rats both directly, through contact with rats, their feces, urine, saliva or nesting materials, or indirectly though mites, fleas, and ticks that have been infected by a rat. This severe, and at times fatal, respiratory disease, is spread when people breath in air contaminated by the virus. Symptoms are sometimes mistaken for the flu. Rat-bite Fever is transmitted through a bite or a scratch from a live rat or through contact with a dead rat. Symptoms include fever, vomiting, muscle and joint pain, and sometimes a rash that begins on the hands and/or feet. This is a disease that is spread through consumption of food or water that has been contaminated with rat feces. Symptoms include nausea, vomiting, diarrhea, headache, and muscle and joint pain. It’s important to note that Salmonellosis is very rarely a problem with pet rats. Can I tackle a rat problem without professional help? Rat excrement and rat nesting materials are a bio-hazard and must be handled as such. The CDC publishes guidelines for cleaning up a rat infestation. Commercial over the counter rat poison is very dangerous to people and pets. It can be lethal if ingested. Rats are incredibly intelligent and will notice and become cautious of changes in their environment, so it’s incredibly important to get the baiting and trapping process down correctly from the get-go. If rats become wary of the traps they will simply avoid them, making the problem increasingly difficult for homeowners to treat. Treating a rat problem entails direct contact with rats in the environments where they are most active. This means accessing crawl spaces or other voids infested with rats. Many homeowners want to avoid this for safety reasons. Who can I call for rat control in Portland ? First of all, if you’re currently dealing with a rat problem, know that you’re not alone. Rats are an increasing problem in Portland, Oregon. Aspen Pest Control loves serving our Portland community including family homes and businesses. We have successfully treated many homes in Portland for rats. We offer free, no pressure estimates and same day service for no extra charge. Our results are 100% guaranteed and we use products that are safe for your family and pets.